By making use of impressive technology, Opti-Free RepleniSH multi-purpose contact lens solution not only cleans contact lenses extensively but maintains their comfort throughout the following day. 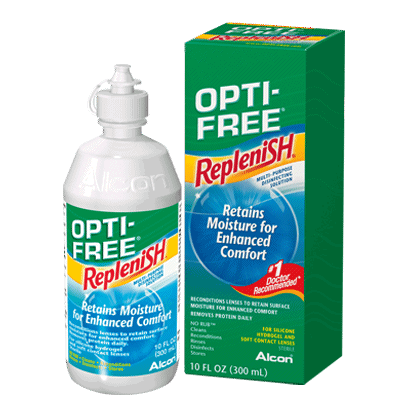 Developed by Alcon & Ciba Vision, Opti-Free RepleniSH performs an extensive an effective clean of your contact lenses ensuring all traces of proteins and lipids that have gathered over the course of the day are removed. This greatly reduces the chance of any irritation or discomfort occurring while wearing your lenses and ensures that your vision will stay crystal clear throughout the day. Opti-Free RepleniSH is also ideal for storing your contact lenses, using its TearGlyde technology to rehydrate them and maintain a high level of freshness throughout their entire wearing cycle. This all-in-one solution can be used on all soft contact lenses, and will ensure they stay fresh and comfortable throughout their entire wearing cycle. Why not stock up on Opti-Free RepleniSH with our twin pack and enjoy even better value for money? If you’re travelling soon, try our Opti-Free RepleniSH Travel Pack. I have used this product for a while but am delighted to find it cheaper with Feel Good Contact Lenses ! Delivery excellent and well packaged.